Today, cufflinks are no longer only a part of formal wear. You can now wear them to parties and social events too! Though wearing cufflinks might seem pretty simple, there are a few essentials which should be taken care of to ensure they are worn the right way. French cuff shirts, make it easy to wear cufflinks. Double cuffed, French shirts have a wide cuff with no buttons attached making them a popular choice to accessorize with cufflinks. These cuffs can be folded back and fastened with some stylish cufflinks. Selecting the best French cuff shirt will not only add to your look, but will also make sure that you make the most of the timeless and effortless style these shirts offer for all formals as well as casual events! Paying attention to the intricate details of selecting the right cufflink is challenging for most men. So, how do you pick the ideal cufflink that complements your shirt? Consider the occasion while buying a pair of cufflinks. Try and pick something that is simple, yet elegant! Cufflinks for formal attire should not be overly ornate. Also, avoid novelty cufflinks for formal events. But, if you’re buying for a casual dinner or gathering, go ahead and pick a novelty cufflink that matches your personality! Fold the large cuffs of the French cuff shirts back in a way that a straight and even line is formed at the end of the sleeve of the shirt. When you’re done with folding the cuffs back, open the edges of the shirt cuff together. Make ensure that the two sides lay flat opposing the wrist. Next, line up the shirt’s button holes to insert the cufflinks properly. Pull the cufflinks through the hole and secure it. 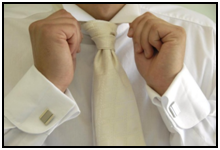 With different types of cufflinks available in the market today, the way you secure the cufflink will vary. Due to its ease of use, cufflinks with bullet back closure are the easiest to wear and are popular with people wearing cufflinks for the first time! Searching for a reliable place to buy designer cufflinks online? AusCufflinks is a great place to start! With a wide range of cufflinks to select from, you can choose the ones that best suit your needs and are consistent with your style goals! They now also sell dapper neckties and bow ties as well.